The Managing Director of Palli Karma-Sahayak Foundation, Mr. Md. 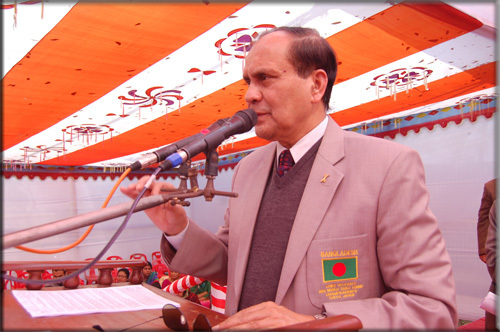 Abdul Karim was made the Guest of Honor in the Grand Conference-2016 convened by Palli Progoti Shahayak Samity (PPSS) in 23rd January, 2016. The chief guest of the grand conference was Khandaker Mosharraf Hossain, Member of Parliament and Honorable Minister of Local Government and Rural Development & Co-operative, Government of Bangladesh. Alongside, Mr. Golam Touhid, Deputy Managing Director (Operations), PKSF was invited as one of the special guests. PPSS is one of the PKSF’s Partner Organizations which runs its operation in Faridpur, Gopalganj, Madaripur, Rajbari, Narail etc. Major activities of PPSS include distributing microcredit, providing health facility and addressing gender issues, with objectives of empowering and improving the living standard of the poor as well as underprivileged widows and abandoned females. In addition, PPSS follows PKSF’s holistic approach of ENRICH. Currently, a population of more than 70 thousand beneficiaries is getting services from PPSS. The grand conference ended in a very well-arranged manner and festive mood.